As we prepare for Athletic Training month to hit in March, secondary school athletic trainers from around the country are helping KSI and the NATA secondary schools committee get a better grasp on the extent of athletic training services that our profession provides. “The KSI team has been working diligently to market the ATLAS Project in various media outlets and get the word out there to secondary school ATs” said Sarah Attanasio assistant director of sports safety policies. 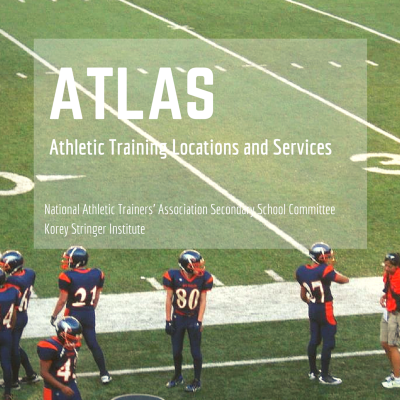 “Thanks to the help of Rachael Oats and all of her colleagues at the NATA offices, the ATLAS project was sent out via e-blast in the NATA Range of Motion and has been posted on the NATA website The ATLAS Project ” said Huggins, VP of Research at KSI. One week earlier, secondary school chair Larry Cooper allocated some time during the NATA board of directors meeting in Dallas, Texas for KSI to speak with the members of the Secondary School Committee. Each district representative was provided with content related to the project for distribution to their members and for easy website viewing. As a sign of their excitement and eagerness to start, some regional athletic training associations such as The Far West Athletic Trainers’ Association and state associations such as Michigan Athletic Trainers Society and Louisiana Athletic Trainers Association are linking directly to the ATLAS Project and it appears to be making rapid progress. “The momentum of the ATLAS project has really shown a positive trend after the official national launch of the ATLAS Project in January,” said Huggins, “we have seen an exponential increase in the number of ATLAS surveys taken. At one point we were averaging almost 100 surveys per day. In the last week or so it has leveled off to 40 per day which is still fantastic.” In response to the increased demand, KSI has brought on five additional workers per week bringing the total workers to 10 (8 undergraduate, 1 graduate and 1 post doctoral fellow). “We all to help sort the data, work directly with secondary school committee chairs in each state, and make each map as accurate as possible” said Rachel Morris, KSI undergraduate research assistant. This entry was posted in Blog Post and tagged Athletic Trainer, ATLAS, NATA.